Every 2 years, Olympic trials provide the rare opportunity to watch people’s huge and impossible dreams coming true. I love the Olympic trials. All of them. I love them so much. If shoe-tying were an Olympic sport, I would be entirely rapt with the selection process. However, I am especially enamored by women’s gymnastics (in trials and in The Games)—I trace this back to my own budding gymnastics career cut short at the fragile age of 8 when, upon receiving an invitation to join my gym’s competition team, my mom said Hell-No-Competitive-Gymnastics-Is-Too-Intense and signed me up for basketball. So imagine my delight when I discovered and immediately dove gleefully into the podcasts, blogs, and Twitter feeds that make up the gymternet—a network of gymnastics enthusiasts who nerd out about the sport and its athletes. I had (and still have) so much to learn. Jessica O’Beirne’s GymCastic podcast is like the mother of the gymternet. The podcast goes in depth with gymnasts, coaches, and experts, and is a must-do for many of the big names in the sport (see: McKayla Maroney’s interview after deciding to retire). In the blogosphere, Lauren Hopkins’ Gymternet blog has shot into popularity, and includes gymnastics history lessons, commentary, FAQs and funny memes. Linking around through the contributors at both GymCastic and Gymternet leads to an array of additional fantastic content. The gymternet is great because it celebrates the sport and the women who compete, but it does more than this. The gymternet is to its roots, political. It insists upon the sport’s relevance and loudly critiques the way popular press ignores, objectifies, and/or infanticizes women gymnasts. O’Bierne’s bio at GymCastic cites gaining legitimacy for women’s gymnastics as her life’s mission. The collective gymternet project is at once promotional, enthusiastic, political, and feminist. The gymternet is also quite efficacious. The social media world of gymnastics fandom and commentary has indeed found its way into the public narrative. This year, NBC hired Hopkins as a researcher for the 2016 Rio Games, and mainstream media outlets reportedly follow her Gymternet blog during live competitions. In this vein, athletes themselves frequently drop news at GymCastic before ESPN or NBC Sports. The effect of gymternet networks upon the media landscape is far from novel—one of the key ways social media has changed public life is through a proliferation of counter discourses that, when reaching a critical mass, refuse to be ignored (see: “ending systemic racism” as part of mainstream political platforms). For a technology theorist/writer, it’s no longer interesting to point out that social media content informs traditional media content and public conversation. The flow of social media content into newspapers, newscasts, and popular culture products is a well-established truism that arguably, doesn’t need to be written about as much as it still is. Instead, it’s surprising when, in today’s media environment, talking heads go along like nothing has changed, ignoring content and conversations on the web. Apparent dismissal of prominent web content is strange, confusing, and was egregiously present among the NBC commentators during the Women’s Gymnastics Rio trials that ended on Sunday night. Over the course of the trials, NBC commentators used words like adorable and fun to describe both the gymnasts and their routines. 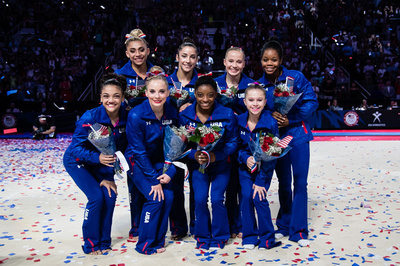 They debated who was more “hyper,” Laurie Hernandez or Simone Biles. One broadcaster asserted that Madison Kocian would be perfect as the lead in a gymnastics movie. Apparently, the athletes’ short statures also required frequent comment, usually accompanied by a warmly paternal chuckle (I’m pretty sure Ragan Smith’s first name isn’t really “Little,” but one might make that mistake by listening to the NBC broadcast team). I also watched the Men’s trials, in which commentators noted strength, precision, and focus among the athletes–things of relevance in an Olympic competition–while managing to avoid the cutesy adjectives. Remember, these commentators work at the network that hired the Gymternet blogger as a researcher!! The NBC sportscaster’s language and sensibility during the 2016 trials would have made sense during the 2012 trials for London—they weren’t okay, but they made sense—because four years ago, the gymternet was still budding (GymCastic launched just after the 2012 Games). Today, they are distractingly baffling. How do professional commentators proceed without regard for, or even seeming awareness of, an entire opposition rising up against their commentary? Given the contributions of the gymternet, how can commentators refer to athletes as tiny while ignoring the reason for gymnasts’ short stature: they have overdeveloped their muscles to the effect of stunted growth. That’s not cute, that’s tough as hell. It’s not that commentators don’t “get” social media. On the contrary, the programming was peppered with content from the athletes’ Twitter and Instagram feeds. For instance, Aly Raisman’s tweet about water proof makeup served as a running joke throughout Sunday night’s broadcast. The NBC commentators also didn’t seem to be actively opposing the gymternet agenda. There was nothing aggressive about the paternalism aimed at the “adorable” and “tiny” athletes, nor anything antagonistic in pondering, along with the Twitterverse, over the conspicuous absence of Gabby Douglas’s smile. Instead, the commentators feminized the sport and the athletes as if it were the most natural thing in the world. They went along as they have gone along, perhaps vaguely aware of some chatterings, but from somewhere far away, from a place that they needn’t really go, with a message they needn’t really address. It was a good reminder that although social media do push society in a political direction, counter discourses, on the web and otherwise, always have to push against. A counter discourse is, by definition, an alternate perspective, one that challenges the status quo. In the case of gymnastics commentary, that status quo is sexism that surrounds women in sport. To be sure, the gymternet argument has made strides. While previously the gymternet argument lived through isolated tirades and passionate screen yelling, it is now on NPR and in The New Republic. But the status quo is big and the internet is a lot of smalls. The gymternet has changed the conversation, a little. Perhaps by 2020, the broadcast sportscasters will be wise enough to speak the gymternet language.